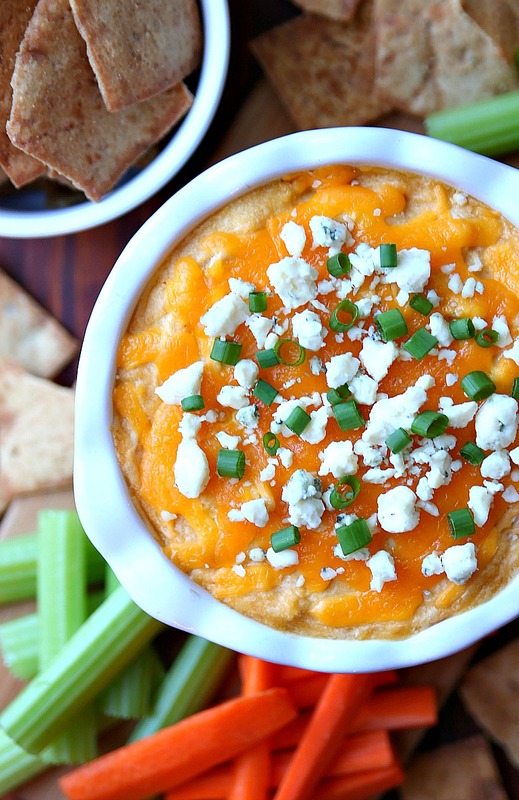 We are huge fans of Buffalo Chicken Dip. We make it pretty much every weekend for a party or get-together especially during football season. But, since we are all trying to eat healthier, I had to come up with a lighter version of our favorite dip. At first I was trying to find clean versions of cream cheese and ranch dressing. 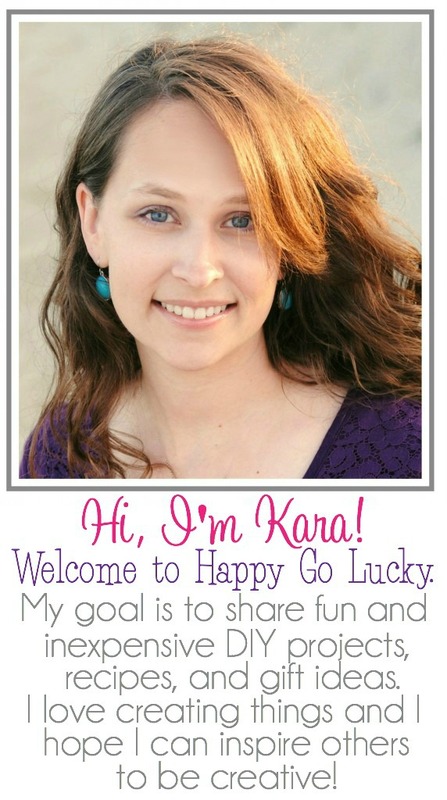 I thought about trying it with Greek yogurt and then it hit me – use hummus. So, that’s exactly what we did and, let me tell you – it’s delicious! I can’t believe I didn’t think of this sooner. It’s such a simple way to lighten up a classic appetizer. 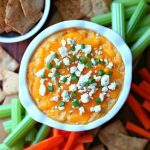 This recipe for Buffalo Chicken Hummus Dip has all the flavor found in the original dip but includes hummus instead of cream cheese and ranch dressing. Okay, my friends – this recipe can not be any easier to mix together. First, start with rotisserie chicken – which means no cooking any chicken ahead of time. Next, use store-bought hummus which eliminates a lot of prep work and just mix hummus, ranch seasoning, and buffalo sauce together. Then add in the chicken and grated cheese. 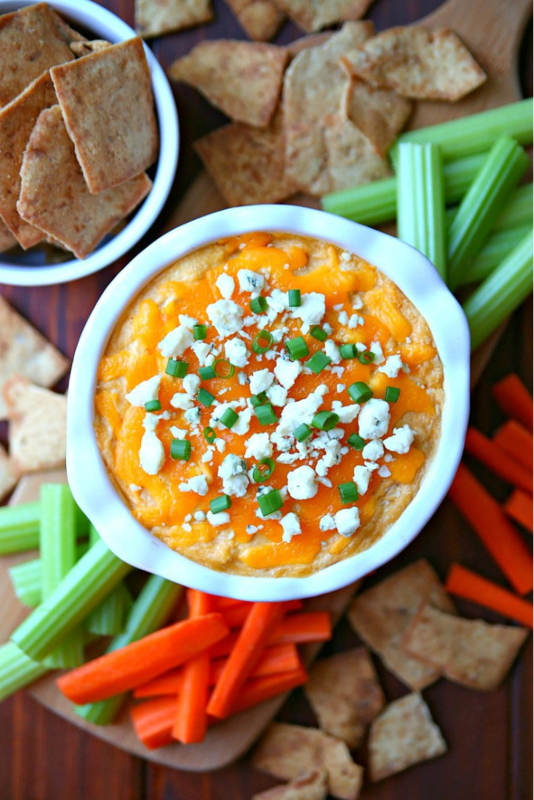 Bake in the oven and your dip is ready. I added a little blue cheese to my mixture but that’s totally optional.